Cold concrete walls and darkness surround you. You've never felt so alone and hopeless. Then you remember all the stories about prison breaks you've ever heard. How did they do it? Maybe if you look around carefully, you might find a hidden way out? Did the Prison escape with a group of four. They let us go over by seven minutes to finish because we’re so close even though we had technically failed. So grateful they let us finish. It was amazing. Worth every penny. Can’t wait to try another! We had a great time in the Prison Break room! Very creepy, challenging, fun, and well-organized experience! Did the Prison room yesterday for my daughter's birthday. We've been to quite a few escape rooms and this was hands down our very favorite. The set was amazing and suspenseful. The puzzles were challenging and the hints were just enough without totally giving it away. We escaped with 90 seconds to spare. We can't wait to come back to do the haunted hotel! Prison Break was an excellent experience and very well executed. Even as we entered the building up to the room, there was a great creep-factor and atmosphere. It would've been extremely difficult if it weren't for my 6 friends' minds simultaneously working together and thinking in different ways, as we had some moments where we felt stumped. Great for groups of 5 or more and anyone that loves pressure, puzzles, and digging around for clues. This was my first escape room experience and absolutely loved it! 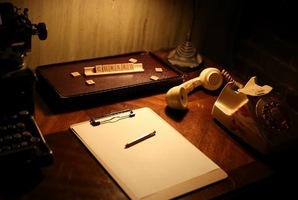 My group chose the prison room and I felt completely absorbed in the atmosphere…the set was well executed, such incredible attention to detail. I wanted it to keep going and going…I wanted to explore more rooms! Seriously a great challenge, it kicked our asses in the best way :D I would love to go back and try the other room and would definitely recommend this to others. Overall great experience, A+!! !